Being a foodie, losing weight or maintaining weight has always been a REAL STRUGGLE. Though I try my best to eat moderately and move around more, it doesn't seem enough. I am glad to be given help by Contours the LaserFit Treatment. I was booked for 6 sessions of LaserFit, to be done 2-3 days apart. Each session involves 40 minutes of cold laser treatment (20 minutes in front, 20 minutes for the back), 10 minutes cardio exercise and 10 minutes vibrafit exercise. It was advised that I should wear exercise clothes for every session. For the first session, my measurements were taken before the laser treatment started. 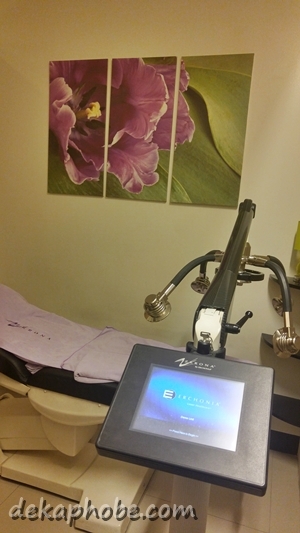 Contours uses Zerona cold laser for the treatment. I didn't feel anything during the treatment. In fact, I took naps during laser treatments to feel more energized for the exercise sessions. 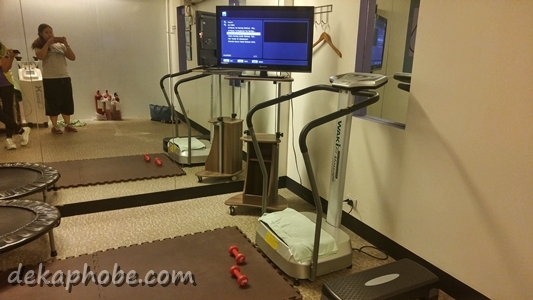 After the laser treatment, I transferred to the exercise room for my cardio and vibrafit exercises. I was glad to be guided by Vangie, my fitness facilitator, the whole time. For the cardio, I followed a 10-minute workout video which kept my heart rate up and my whole body sweating. After the cardio, I did my vibrafit exercises, which included planking, push-ups, and squats. I was advised to stick with warm to hot drinks, eat with moderation, and exercise or walk around more. Getting a massage after a session will also help. I was given a guidebook for more tips and to log my appointments. After the third session, I noticed that my clothes are starting to feel loose and my sides are starting to look slimmer. Also, I have noticed that my appetite was lessened as I feel full with less food and my cravings greatly diminished. The second measurement was after my sixth (and last) session. According to measurements, my weight stayed the same but I lost 10.5 inches overall. I was asked to return for the last measurement one week after my last laser appointment. According to measurements, I lost 3 kgs (6.6 lbs) and another 8.2 inches. After 6 LaserFit Sessions, I lost a total of 3 kgs (6.6 lbs) and 18.7 inches. I was advised to keep exercising, move around more and watch what I eat because my LaserFit treatment will still be taking effect one month after the last session. Thanks to Contours for having me.